In order to make the nightmare stop, Vienna Rossi realizes she must take matters into her own hands. She’s compelled by an unseen force to hop on a last-minute flight to track down a murderer. Awakened within her is a psychic gift she never knew she had, a handsome spirit guide who drives her nuts, and the ability to help lost souls cross over to the other side. 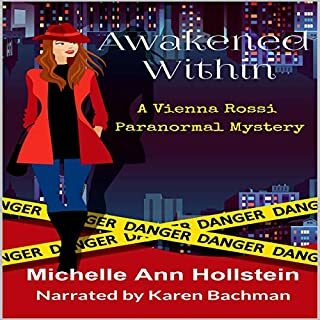 Vienna and her spirit guide, Jack, team up with Vienna’s best friend, Kim, for a dangerous murder-solving, ghost-hunting adventure. A good story. I usually listen to books on long drives, but I ended up finishing this one on short drives around town because I wanted to hear what happened next. Narrator was fabulous, made it lots of fun with the different voices.